I’m a Brisbane and Gold Coast wedding and engagement photographer. This gallery of engagement photography shows a representation of the many various types of engagement sessions that I have had the great pleasure of photographing. 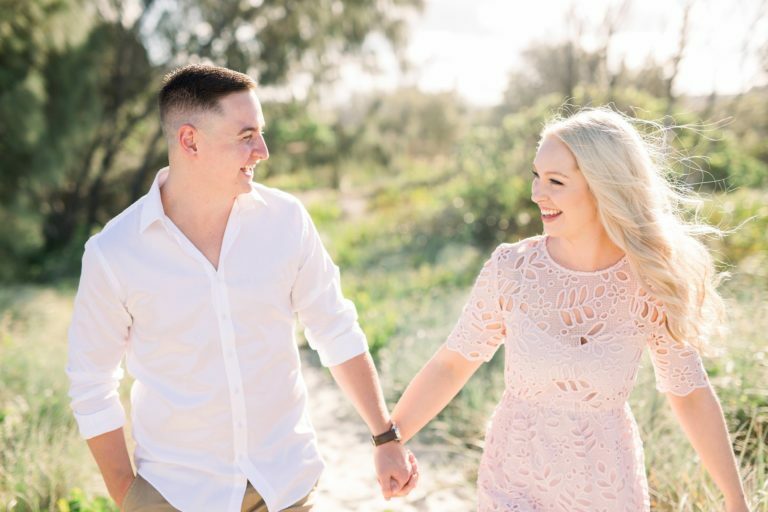 You will see engagement pictures all over Brisbane, Gold Coast, Kingscliff, NSW, Mount Tamborine, Byron Bay, Sunshine Coast and even Amalfi Coast engagements. Now that you have picked a date, a photographer and probably a venue as well, you can celebrate! Those are some of the toughest decisions in wedding planning and you can cross them off your list! Hooray!! Now on to the fun stuff…. like your engagement session! I include engagement sessions in The Wedding Experience because I truly believe that they are a VITAL part of the entire process. During your engagement session, you’ll have the chance to get to know me, experience how I shoot and how I handle posing and lighting. This session will make a HUGE impact on how the wedding day flows. I’ll arrive on your wedding day already knowing how you two interact, what your best poses are and how to photograph you in a genuine way! 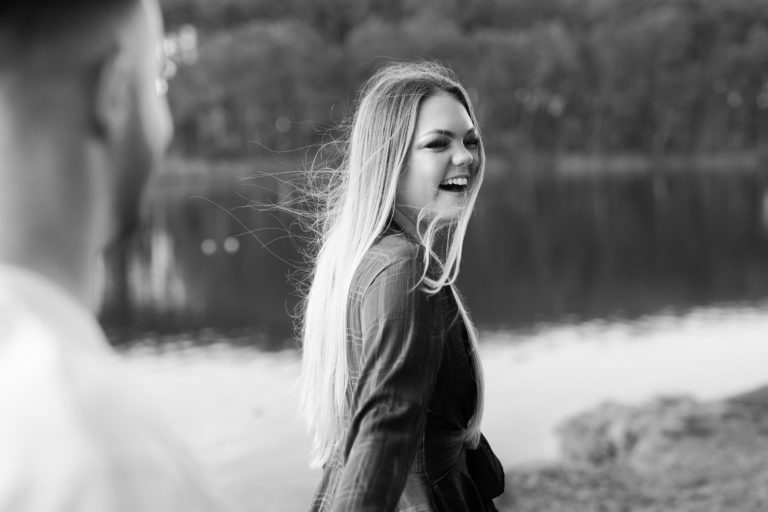 What I will learn about you during your engagement session is invaluable! You will feel like such a pro on your big day because of the great practice you had during your engagement session and that’s how it should be! Your engagement session can be scheduled anytime before your wedding day. I normally suggest booking it at least 3-6 months in advance to avoid stress. Because our weekends are filled with weddings, I shoot engagements normally from 4-5pm depending on the light and the time of the year. In the winter months, 3-3:30pm is a normal time frame for an eshoot! As you start to plan for your engagement shoot, you will need to start brainstorming about location ideas. I LOVE it when couples pick a location that is special or sentimental to them in some way! If you can’t think of anywhere specific that you would like to shoot, I can help you decide on a location! As long as the light is great, I can make ANY location look awesome! I shoot at farms, campuses, downtown alleys and even laundry mats! I’m serious! Do not shy away from crazy ideas! The more creative, the better! Be sure to keep reading to find out more about outfit ideas and inspiration! I wanted to share images from different locations so that you could see the many beautiful engagement photo locations that are possible. 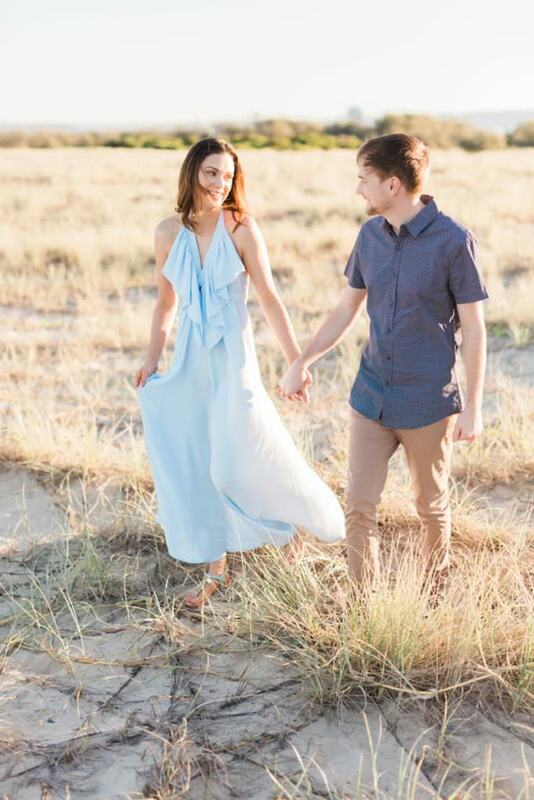 There are dozens of amazing Gold Coast and Brisbane engagement photo locations. One of my favourite is The Spit on the Gold Coast. I also love Brisbane Powerhouse, Evergreen gardens venue, Fingal Head near Kingscliff, the Canyon Lookout ( one of my favourite lookout from the Springbrook National Park), Gold Coast Pine Forest located in Miami, Kangaroo Point, Mount Tamborine, Mt Coot-tha Botanic Garden. If you’re a Brisbane fan, you might even want to consider having your engagement pictures taken at UQ University in St. Lucia, the colours of those building are simply amazing. If you are trying to decide when to take your engagement photos, consider getting them done in a different environment than your wedding. 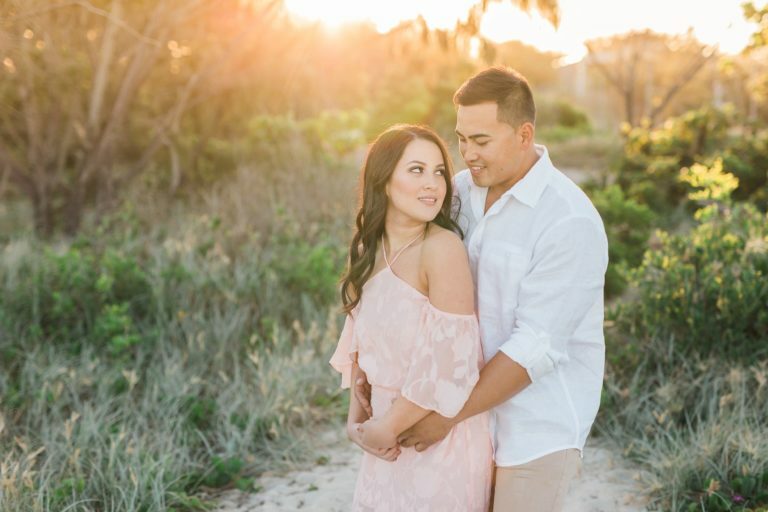 If you’re having a beach wedding, what about a beautiful city engagement session? Or if you’re planning for a church wedding day, what about beautiful garden or a nice mountain lookout? In Brisbane and Gold Coast spring is my favorite season for engagement pictures, the blooming trees make for an incredible backdrop !